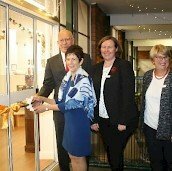 The Infants’ Home celebrated the Grand Re-Opening of Rigby House, newly renovated with inspiring and inclusive environments, with a champagne and canapes event attended by over 80 friends and supporters on Wednesday April 18 from 6-8pm. 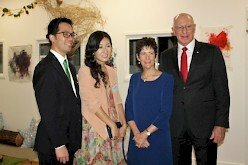 We welcomed His Excellency General The Honourable David Hurley AC DSC (Ret’d), Governor of New South Wales, and our Patron, Mrs Linda Hurley, to The Infants’ Home for the first time, as our guests of honour. 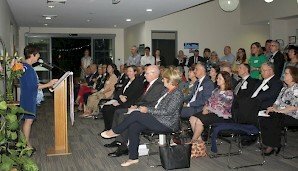 Guests were treated to an Acknowledgement of Country and cultural dance demonstration from Uncle Terry, an original song for Rigby House written and sung by Mrs Hurley, Yumi Wong-Pan’s family story of how having her children at The Infants’ Home has helped her, and a showcase of Rigby House history. Rigby House is one of five Early Childhood Education and Care centres located at The Infants’ Home. It was established in 1959 as a nursery to meet growing child care needs for babies, and has well-served generations of families in our community over time, and is now fully renovated to continue to provide services for families into the future. The evening ended with tours of the newly renovated Rigby House. We thank all those donors and supporters that gave generously towards Rigby renovations, and all those who attended the event. At Johnson House Preschool, children have been practicing their fine motor skills by ‘threading’ pieces of pool noodles onto a large rod. Threading facilitates fine motor manipulation – the key skill needed for writing, drawing and using scissors (and therefore the beginning of school readiness skills). Threading with pool noodles is not only fabulous for developing fine-motor skills but can also be used as a way to introduce children to a variety of mathematical concepts such as colours, patterns, shapes and counting. Johnson House pre-schoolers have been exploring the grounds and finding treasures which have fallen from the trees. These experiences help invite open-ended interactions, spontaneity, risk-taking, exploration, discovery and connection with nature. They foster an appreciation of the natural environment, develop environmental awareness and provide a platform for ongoing environmental education. Toddlers at Murray House have also been engaging in role play, playing roles of Doctor and patient. Educators provided some equipment to facilitate this, including gowns and stethoscopes. Children looked after their ‘dolly’ patients, putting on their doctor’s gown and placing the stethoscope on the doll’s chest, and gently patting the doll. Some children expressed that “dolly need medicine”, showing awareness and knowledge that medicine can help to make people better. Murray House children have been engaging in sensory experiences, making goop with cornflour and food colouring. The children were excited and curious to touch and feel the texture of the goop. As the children noticed the different feel and texture each time they dipped their hands into the tray, they responded with giggles and laughter. The children enjoyed the experience as it turned into a messy sensory play. This experience supported the children’s Social development – children interacted with staff and their peers by sitting down together and enjoying the experience. Physical development was also supported as children used their fine and gross motor skills to explore the texture, hand-eye coordination, concentration, exploration skills & imagination skills. Many children in Gorton Pre-school desire to test their physical abilities by seeking further challenge within their physical environment. Over the past couple of years educators have worked alongside The Infants’ Home’s Occupational Therapist, Justine, and supported this learning and desire for risk-taking by adding various spaces to the environment. For example, the flying fox continues to be one of the most favoured pieces of equipment, with children mastering the challenge and then seeking to further deepen it by swinging themselves upside down. Other children swing and then leap as far as they can into the sandpit. Children in Gorton House Infants have been exploring mathematical concepts and expressive language through wet sand play. A small group of children aged 18 months to 2 years have been finding sand print resources of different shapes and sizes, and using them to make prints in the same. As co-learners, educators have been able to have extended time playing alongside, chatting with these children as they built these ideas day after day. 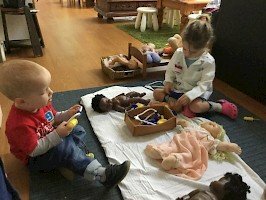 Several of the children involved attend 3 or 4 days a week, and had plenty of time to explore, return to this play, and build on ideas from previous sessions. Rigby House children have been taking part in open-ended art experiences, allowing children time to explore and engage in the process rather than focus on the finished product. 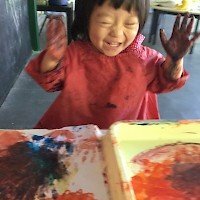 Rigby children have the look of pure joy as they explore painting! At Rigby House, volunteers from De La Salle College Ashfield have helped to put together planters and helped to fill them up with soil. Educators and children have been busy planting, with babies and toddlers practicing using their ‘slow and gentle hands’ as they admire the plants that grow. Learning about plants is a great opportunity for the children to learn about mathematical concepts such as short and long, near and far and compare the sizes of the leaves. At Robinson House, Early Childhood Teacher Sarah has been doing some science experiments. After reading the book Who Sank the Boat? Children tested out the concepts of weight and sinking. A group of children and educators formed hypotheses around the whether various objects would be heavy or light, collecting different objects and then taking turns to place them on the scales. Children discussed how items were balanced, and expressed surprise that a ball that looked soft and hollow was actually heavy. This activity enabled the group to continue to explore new science concepts and broaden their understanding of balance, and the process of cause and effect. The children would like to explore other liquids and sand in the scales. Children at Robinson House have been investigating ways in which they can look after the environment. 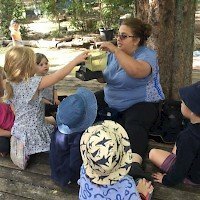 Lauren, an educator at Robinson House, thought that it would be interesting to explore bush tucker with a focus on the foods on the grounds at Robinson House. Children have been gathering seeds and berries and identifying them through books. They hypothesised about what they may taste like and how they may be prepared. Children identified that picking berries takes food away from possums, birds and the plant’s ability to spread its seeds. One of the children then came up with the idea of planting the seed from inside the fruit in the hope that it may grow again. Educators have honoured this by replanting the seeds from the Lilly Pilly berries they eat. 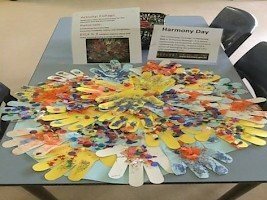 For Harmony Day 2018 all the children and educators at Randwick Family Day Care Playsession were invited to participate in a discussion and collaborative art project. The children and educators discussed concepts such as ‘why do we hold hands?’ ‘Who are our friends?’ and ‘how can we all work together?’ This was a wonderful opportunity to explore belonging, the relationships that we have with others and how our actions can make others feel that they belong too. Sammy, a Family Day Care Educator from Family Day Care St George Hub, used bed slats from a bed that was no longer needed to restock her block corner. Sammy cut up the slats, sanded them down and then they were ready for action. This experience embedded sustainability practices into Sammy’s family day care program and engaged the children in using resources made of natural materials. The children developed a range of skills and used problem solving and experimentation to work out how to stop their towers from falling.